Bring a large pot of water up to a simmer. Plunge the pork into the boiling water for 2 minutes, this will remove any impurities from the pork. Remove the pork from the water, strain in a colander and set aside. Discard the used water. Heat the Extra Virgin Olive Oil in a large pot or wok, add ginger, spring onion and slowly sauté until brown and fragrant. Add in the star anise and cinnamon and cook for 1 minute. Add in the pork and sear the outside for a 2-3 minutes moving the pieces around the pan. Pour in the Lee Kum Kee dark soy sauce and Shoaxing wine to deglaze the pan. Add the brown sugar and enough water to cover the meat. Cover the pan, lower the heat and simmer for 1 hour. Remove the cover, add in the vinegar and continue to simmer for 15-20 minutes, or until the liquid has reduced by two thirds. Turn up the heat and boil until the sauce has turned glossy and coats the pork. When the pork is almost ready, start on the Chinese greens. Give the Chinese Greens a flash in cold water then place into a hot pan. Drizzle with Sesame Oil and toss through for a minute or two until slightly wilted but still crunchy. Sprinkle with salt and give a generous squeeze of lemon. Plate up the greens, adding sesame seeds on top. 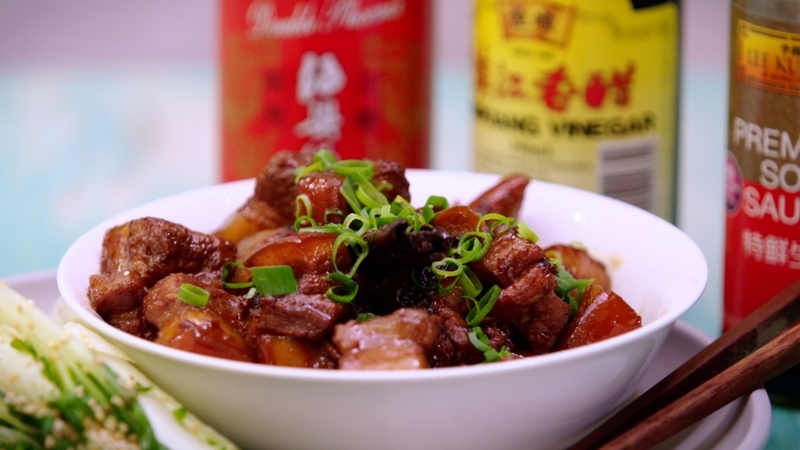 Using a large spoon, serve the Shanghai Braised Pork Belly into a large bowl, garnish with finely chopped spring onions and serve with steamed rice.